Boil the beans from half to three-quarters of an hour, in water, a little salt. Cut off the corn from the cobs, boil the cobs with the beans, be sure and not cut too close to the cob. When the beans have boiled three- quarters of an hour, take out the cobs and put the corn in; let it, then, boil fifteen minutes, if the corn is tender, if not, twenty. Have more corn than beans. When it is boiled sufficiently, take a lump of butter as large as you think will be in proportion with the vegetables, roll it well in flour, put it in the pot with the beans, with black pepper enough to season it well. This is a real Western dish, and is very easily made. 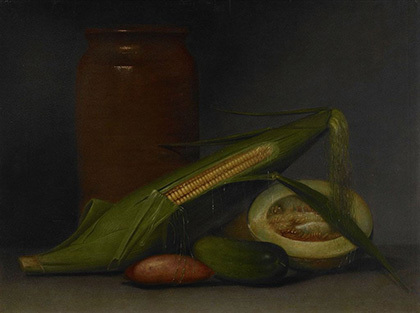 Image: Raphaelle Peale. Corn and Cantaloupe, c. 1813. Courtesy Crystal Bridges Museum of American Art, Bentonville, Arkansas.